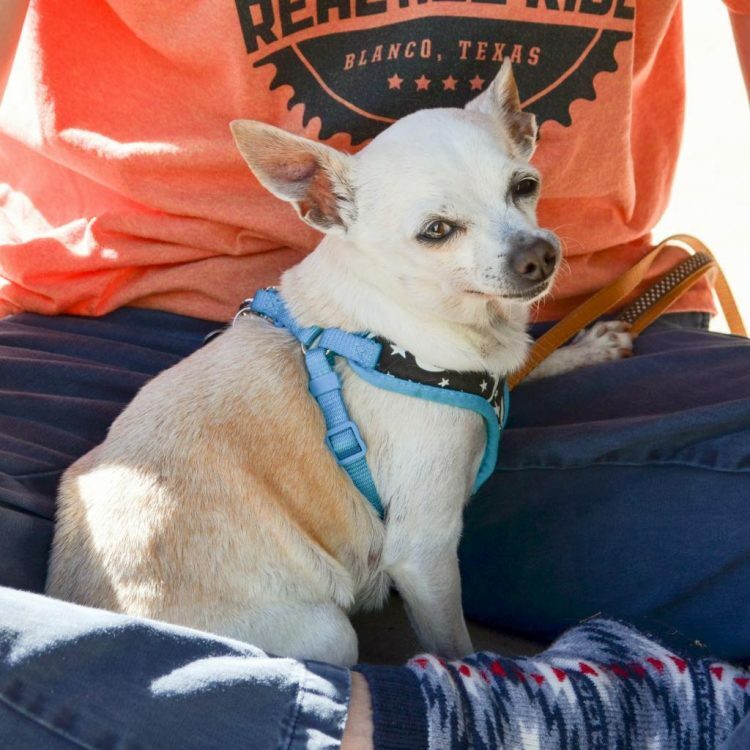 Fideo is low energy gal and a lover of relaxing pastimes like naps and sunbathing, but she's still pretty spry for her age and isn't beyond a few zoomies around the house or a roll in the grass. But she's definitely up for napping anytime of the day and will try to nest in any spot that looks remotely soft, whether that be a pillow, a blanket or the laundry. Fideo doesn't demand a lot of attention, but expects it when she seeks it out. She will climb in your lap for pets and nudge you with her head to let you know you're not done. She's pretty independent and likes to be in the same room as you and sometimes nap next to you or on your lap. She seems curious with strangers, though she doesn't want any new person to touch her until she knows they're cool. But once she warms up, she'll greet you when you come home with a rapidly wagging tail and her adorable snaggle tooth smile. And she gives kisses! Fideo naps when left home alone and stays in an xpen with a puppy pad. She did figure out how to get out of the xpen on the first day (she just needed to scoot it over three feet and then she was out! ), but she was well behaved for her few hours of freedom. She sleeps quietly through the night, is house-trained, hasn't shown any destructive behaviors and doesn't whine. Fideo goes on "walks" in the backyard, and while she doesn't seem to know any commands, she's great on leash and loves exploring the yard. She also likes to sweep the kitchen floor for crumbs. Fideo has lived with multiple dogs in the past and should do well with smaller or older pups. She hasn't lived with cats but totally ignores the neighbors cat when he is hanging out in the yard. Laid back, smart and independent, Fideo is a low maintenance lady who's just looking for a home that's as chill as she is. Come meet her! 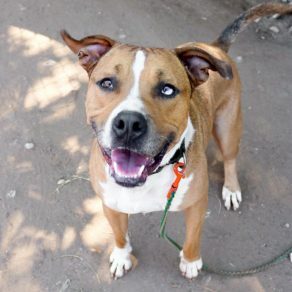 I saw Fideo (https://www.austinpetsalive.org/adopt/dogs/apa-a-70154) on the Austin Pets Alive! website and would like to request more information.